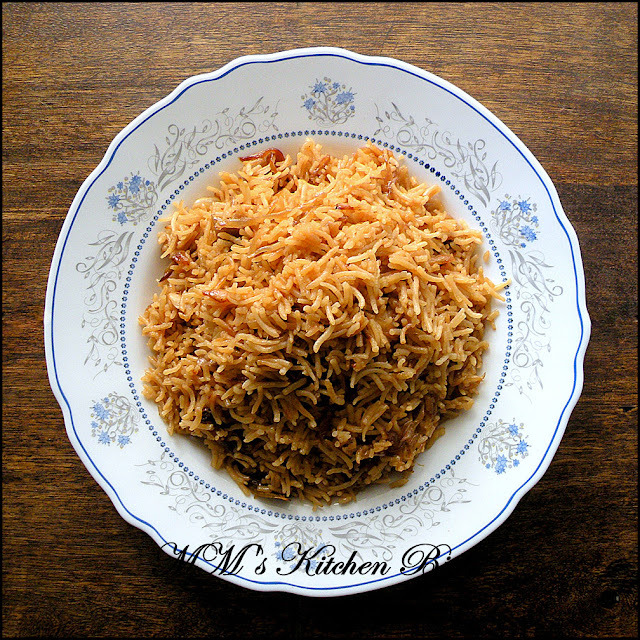 MM's Kitchen Bites: Parsi Caramelized Brown Rice...give me some sugar!!! Parsi Caramelized Brown Rice...give me some sugar!!! Heat ghee in a heavy bottomed deep pan. Lower the heat and add green cardamoms, cloves, bayleaves, cinnamon, star anise and black peppercorns. When the spices start to sizzle, add the onions. On low heat, fry the onions till they start turning pale golden brown. Add the sugar and stir until sugar starts to melts and then caramelize and onions takes on the colour. Keep a constant watch and low heat – all that caramelized goodness can very easily burn and go bitter. Add in the drained out rice and salt. Gently mix everything so that the rice gets nicely coated with onion mix – do the mixing gently so that the rice grains don’t break up. Add in the water now and increase the heat. Give a final stir. Once the water comes to a boil, cover with a tight fighting lid and lower the heat. Let it cook till all the water evaporates and rice is cooked. Lightly fluff up the rice with a fork. Cover the mouth of the pan with a thick kitchen towel and put the lid back on. Remove the lid and towel after 10 minutes. Typically served with Dhanshak (meat with lentils) but goes quite well with all other dals, curries and kababs as well. Typically cumin seeds and black cardamom are also added, but I normally skip for my version. 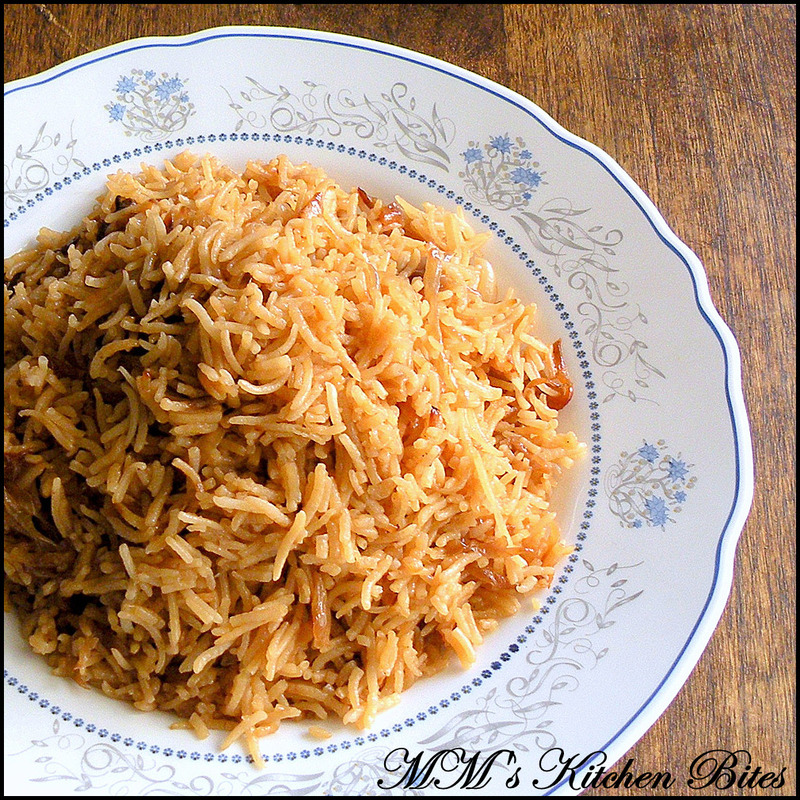 Do adjust the amount of water used to the kind of rice you use. If you are not convinced that sugar will taste nice in the rice, you can try no sugar version posted here. 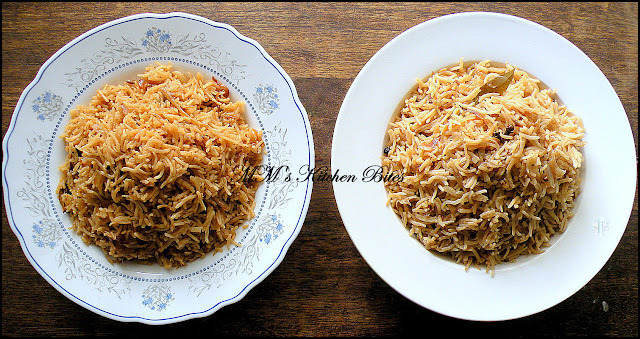 The sugar version gives a darker richer brown colour – below is how both versions of rice look.